Bale, United, a perfect match? Gareth Bale was leaving with his award as Zinedine Zidane entered the room. His manager knew how he would have been feeling. The Champions League final man of the match from 2002 was Zidane. Now Bale had equalled him, many would even say bettered. In the search for parallels, comparisons were being drawn between Bale’s bicycle kick and Zidane’s volley against Bayer Leverkusen 16 years ago. Bale’s goal was widely considered the upgrade. As they passed in the doorway of the auditorium, Bale and Zidane clasped hands warmly, as great athletes do when they have shared a moment. They broke into huge grins of gratitude and empathy. Minutes later Bale would be claiming Zidane had not spoken to him all night, Zidane would be reminding his player that he alone picks the team, and there is not room for everybody, every week. So it’s over. Let’s face it, they’re done. When Zidane talked of Cristiano Ronaldo’s tease around his future it was as if he had been asked about selling the Bernabeu to the Jacksonville Jaguars; when Bale’s plea for more game time was mentioned he received the verbal equivalent of a Gallic shrug. 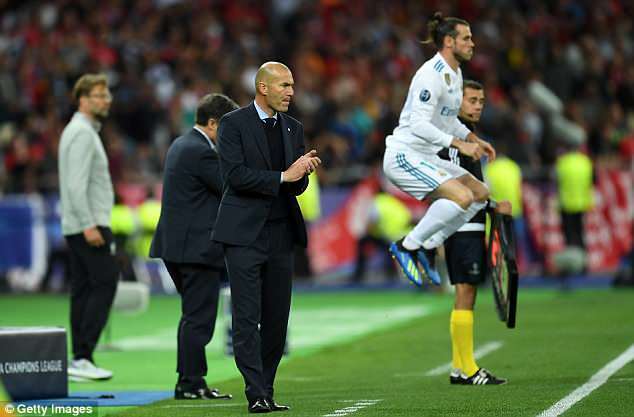 This is the second consecutive Champions League final after which Zidane has been quizzed on Bale’s prospects at Real Madrid and on neither occasion has he sounded enthused either way. 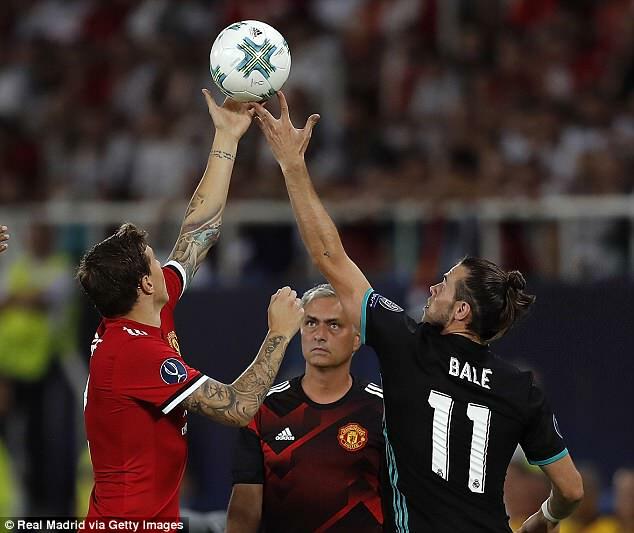 The difference is, a year ago, with the match already won, Bale was given a sympathetic late cameo at a final in his native Wales, a nod to the occasion after a long run of injuries. Here, he was still a substitute, but also the game-changer. He scored twice, introduced for Isco on 61 minutes, the first so good it should have counted double anyway. He was, in short, brilliant. And Bale was right. At this stage in his career, he shouldn’t be anybody’s understudy. He may miss the old explosive pace that once destroyed the world’s finest full backs, but his instinct for defining matches is undimmed. This was a point devastatingly proved on Saturday. He can still beat his man when the mood takes him and, like Elvis Costello, his aim is true. It didn’t feel like the swansong of a fading talent. It felt like a timely reminder from a man who could again transform a Premier League club. And one in particular. Tottenham may have first option on Bale but his fee and wages seem beyond their remit and, anyway, why revisit old ground? Manchester United are the match. Jose Mourinho needs a way of taking a bolder game to Manchester City; Ed Woodward, the chief executive, sees it as United’s commercial duty to pursue marquee names. And Bale is that, again, after Kiev. He arrives a United legend before he kicks a ball. The man who stopped Liverpool’s frenzied European campaign in its tracks; the man who left Jurgen Klopp both in the red and potless. Bale doesn’t even have to kick a ball on his debut. He could just do a lap of honour of Old Trafford with a picture of that goal. Fitness is an issue, plainly. 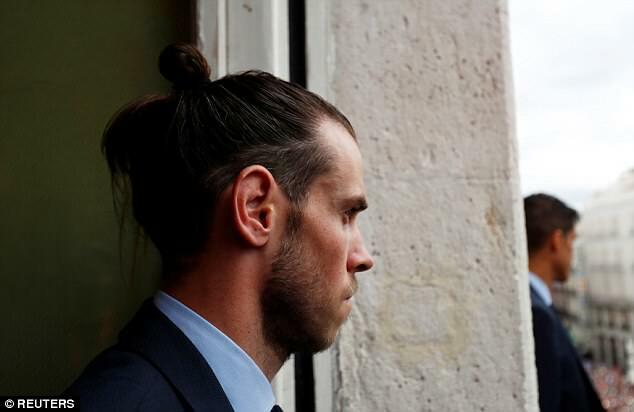 Bale may play down his struggles but there have to be concerns. In November, when a thigh strain kept him out, it was calculated that this was the 11th injury of his time in Spain, and he had been unavailable for 40 of Madrid’s last 60 matches. Buying him would be a gamble, certainly if Madrid wanted anywhere near their £86million investment back. Yet now, it doesn’t feel like the risk of, say, a week ago. 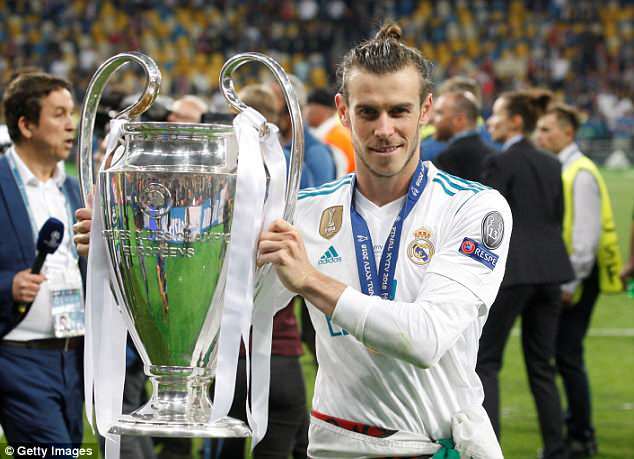 Bale didn’t just change the final on Saturday, he changed his narrative, the wider perception of his post-Madrid worth. He is not the winger who made Maicon a punchline, but he is a forward capable of deciding the biggest game in club football, and with a goal that will resonate half a century from now. He remains a headline act — the scorer of 21 goals in what was considered an underwhelming season. Replicate that at Manchester United and he is box office. In the absence of a philosophy as profound or lovely as Pep Guardiola’s, Manchester United are about nothing if not the business of show. Woodward says the club have a duty to English football to compete for the biggest names. He means they have a duty to the brand. If United cannot win the league since Sir Alex Ferguson’s departure, they can still make a splash in the market and command attention that way. Angel Di Maria, Radamel Falcao, Anthony Martial, Paul Pogba, Romelu Lukaku, these were signings designed to reassert United’s position within the elite, even if not all were successful. Buying Bale would be a similar move. Yes, it would represent an expensive gamble — his injury record is every bit as real as his two goals against Liverpool — but it would feel like a coup, certainly in England. Bale’s physical state might need careful management because the Premier League is even more demanding than La Liga, but this is not a performance that can go unnoticed. Just his name on the team-sheet will inspire memories of one of the greatest individual performances of the Champions League era — he hit a cross that should have been turned into a fourth goal, too — and that makes defences nervous. Yet if Bale returns will he ever face Loris Karius in Liverpool’s goal again? It is impossible to say, right now. This was a traumatic, potentially career-altering, display. Indeed, if Karius has convinced many he is on an upward trajectory this season, here was a setback as destructive as has ever been witnessed. A personal implosion that must damage the faith placed in him by his manager and team-mates, too. That Karius was left alone, face down on the turf, sobbing, by his colleagues at the end of the match was a disturbingly brutal image. It was left to white shirts from Real Madrid to console him, to get him up, to try to rebuild his fragile psyche. Virgil van Dijk, in particular, decamped to the other end of the pitch, and sat, as if not wanting to be tainted by association. Even if Klopp is forgiving, how can they learn to trust him again next season? Frank Lampard was right. This was an elite match, and Karius’s performance had no place being there. Anyone can have a bad game, is the cliche, but they cut deeper for goalkeepers. If there is a precedent for what may befall Karius, it is the fate of Scott Carson. Promoted to first choice for a deciding European Championship qualifier against Croatia in 2007, Carson’s blunders were largely to blame for England’s failure to qualify. Signed by Liverpool, and touted as the successor to Paul Robinson for England, Carson never recovered. He rebounded to West Brom, Bursaspor in Turkey, Wigan, now Derby. He has had a reasonable career, but nothing like what was promised. That night did for him. Having afforded Karius such strident backing, it would be a significant admission of error for Klopp to abandon him now, but if he is focused on challenging in more than cup competitions next season, he may have no choice. It will soon become apparent whether Karius can rebuild his relationship with his team-mates, and perhaps the damage is irreparable. He was talking of the injury to Mohamed Salah, the goalkeeper’s mistakes, the once-in-a-lifetime strike from Bale — he had never scored from a bicycle kick, he admitted — but there were judgment calls in that litany of disaster, too. Prime among them, Klopp’s stubborn belief that he had a burgeoning elite keeper in Karius. If he did before, he may not now. 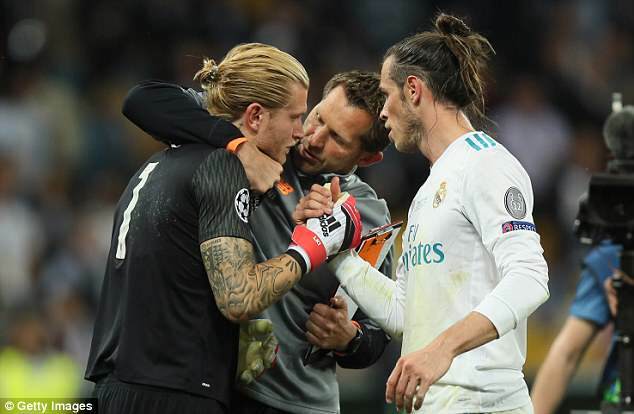 After Kiev, Bale and Karius are both off-script in a way few, least of all their managers, could have imagined.